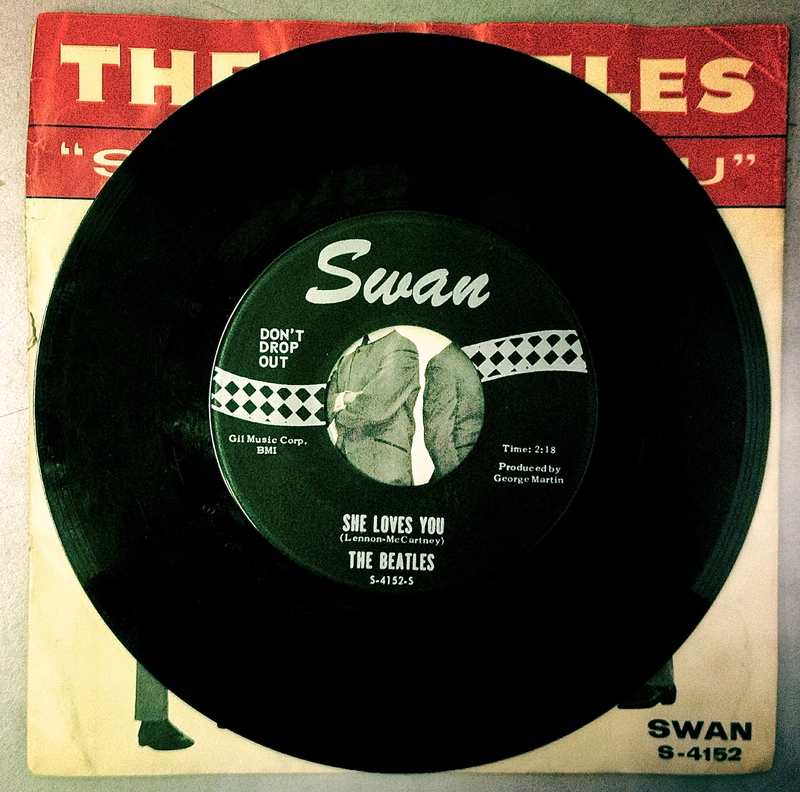 Swan Records still had the rights to “She Loves You,” and re-released the song in March of 1964. It is the re-issue that we have here—the first run has a white label, while the second run reflects the change to a silver-on-black label that Swan had switched to a few months before it was released. 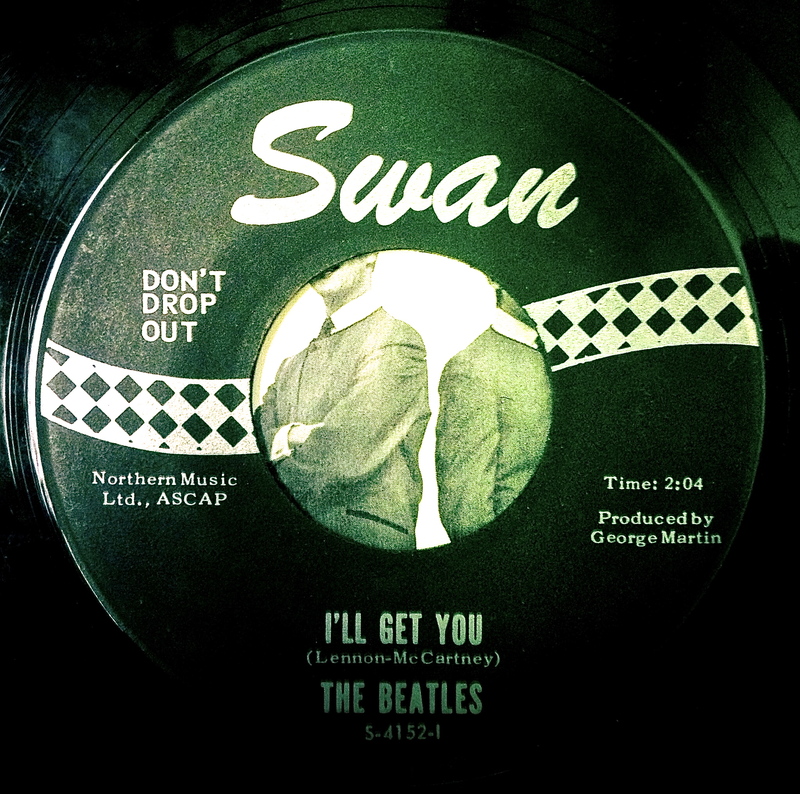 “Don’t Drop Out” was added to the labels of all of Swan’s 45s to discourage juvenile delinquency and keep kids in school. “She Loves You,” for all of its pop sugar, is a pretty clever song. First of all, the lyrics are coming from the perspective of a third party trying to get his friend to wise up and get back the girl he loves. The norm, then and now, was of course to have the singer plead directly to his paramour. Or, if it were a country song, an omniscient narrator would tell the story—maybe even going so far as to open with a line like, “Well, here’s a story about…”. Not here. It’s just two friends talking. Or rather, three, since John and Paul are singing together. The song starts right off with one of Ringo’s best fills and then goes straight into the refrain, putting the catchiest part of the song at the beginning. There’s no real bridge to speak of; there was certainly room for it—even by the pop song standards of 1963, 2:18 is pretty short. There just wasn’t a need, so why complicate things? George Martin was already proving his worth as a top producer, making sure Paul’s bass guitar and Ringo’s bass drum were higher in the mix than was typical for the time. It all adds up to a cleverly constructed song that hooks the listener in almost immediately and holds their attention for the length of the tune. The B side is called “I’ll Get You.” The melody is easy-going enough, and it’s easy to think of this as just another love song telling the story of a boy determined to get his girl. And that it is, but there’s something in the way John sings the lines “I’ll get you, I’ll get you in the end. Yes I will, I’ll get you in the end” that betrays the creepy obsessiveness that lies at the heart of so many seemingly innocent love songs. Once again, there’s no bridge. The harmonica adds an unexpectedly country tone to the song that matches up nicely with the twang of George’s guitar. “I’ll Get You”—catchy and creepy. 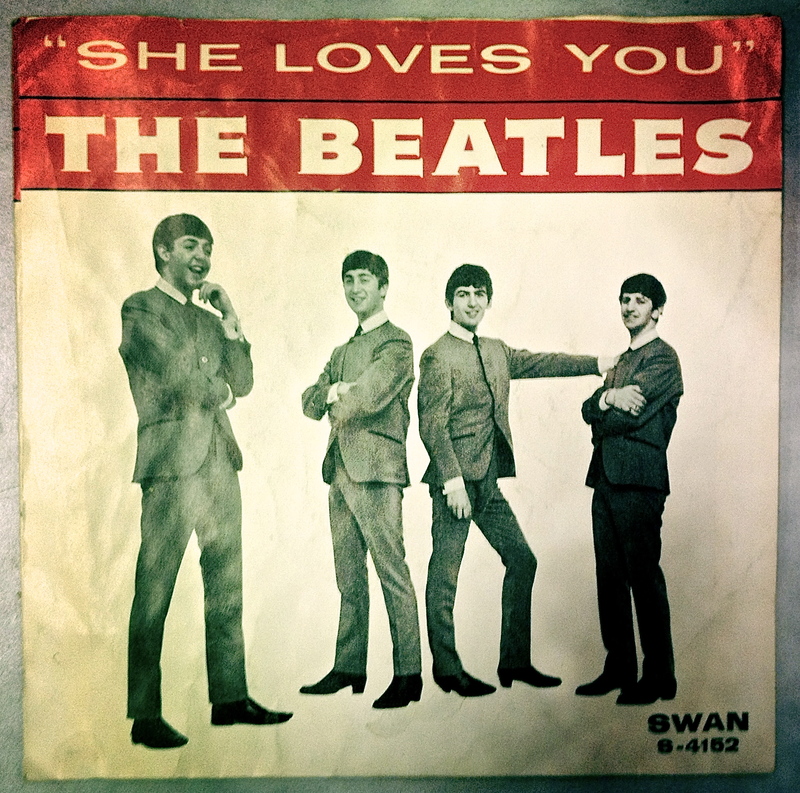 The right to publish “She Loves You” expired in 1965, and Capitol, eager to make up for its past lapse in judgement, swooped in and took The Beatles away from Swan. They had lost Freddy Cannon to Warner Brothers the year before, so the loss of their best-selling single proved to be a crippling financial blow, and the label had folded by 1967. That same year, The Beatles released their most ambitious album and had retired from playing live shows, committing themselves to pushing the limits of what could be accomplished in a recording studio. “She Loves You” may not be as accomplished or avant garde as some of their later work, but it is still a little bit of pop genius that most bands would have killed for. This example—and many other examples—of The Beatles’ genius is currently on display at The Library For the Performing Art’s exhibition, “Ladies and Gentlemen…The Beatles!”. The exhibition is up until May 10th, and it’s well worth your time if you have even a passing interest in the Fab Four. And if you’re a fan, it’s an absolute must.